The body of Mollie Tibbetts, a 20-year-old sophomore at the University of Iowa who went missing in July, has reportedly been found. Cristhian Bahena Rivera, an immigrant to the US from Mexico, was arrested and charged with first-degree murder in connection to Tibbetts’ death. Law-enforcement officials have said Rivera is in the country illegally, though the suspect’s lawyer has disputed that claim. President Donald Trump and some right-leaning media outlets have used Tibbetts’ death to promote connections between illegal immigration and violent crime. Statistics suggest, however, that unauthorised immigrants actually commit crimes at lower rates than native-born citizens. Mollie Tibbetts, a 20-year-old sophomore at the University of Iowa, was last seen alive while jogging the evening of July 18. This week, authorities said that she was killed and that her body was dumped in a cornfield. On Tuesday, the police arrested a Mexican immigrant named Cristhian Bahena Rivera as a suspect. A warrant filed by the Poweshiek County Sheriff’s Office said Rivera confessed to the police that he pursued Tibbetts and later concealed her body. The police charged Rivera with first-degree murder, which in Iowa comes with a possible penalty of life in prison. By Wednesday, law-enforcement officials claimed Rivera was living in the US illegally and that he’d somehow passed the government’s E-Verify system as an eligible worker – apparently with stolen identification, The Washington Post reported one law-enforcement official as saying. The case is ongoing, and Rivera’s lawyer has reportedly disputed claims that his client is in the US illegally. ABC News also reported that Rivera had worked for up to seven years at Yarrabee Farms, a company owned by Craig Lang, a former president of the Iowa Farm Bureau and “an active member” of the state’s Republican Party. At the same time, some right-leaning politicians, figureheads, and media outlets appeared eager to exploit the developments and push false narratives about unauthorised immigrants and violent crime. President Donald Trump – who in June 2015 falsely claimed that “many” immigrants from Mexico are rapists and drug-traffickers, and who recently approved policies that prompted the separation of thousands of migrant children – received extensive news coverage for weighing in on Tibbetts’ death. Trump on Wednesday evening posted a video saying Tibbetts was “permanently separated” from her family, using a phrase that has gained momentum in right-leaning circles to describe American victims of crimes blamed on unauthorised immigrants. Tibbetts’ death dominated Fox News’ news coverage on TV and online Tuesday, and, in a post Wednesday, the Fox News media reporter Brian Flood claimed several major media outlets “ignored” the apparent “bombshell development” regarding Rivera’s immigration status. News of the claim broke shortly after two of Trump’s closest associates were convicted of crimes, with one of them – Trump’s former lawyer Michael Cohen – implicating the president in several felonies. What is implied in such statements is that fixing illegal immigration in the US will, by extension, fix the country’s violent crime rates. This would be a compelling idea – if the best evidence available didn’t show it to be very misleading, if not false. No set of data is perfect, and organisations that seek to restrict immigration have identified several issues with statistics regarding criminality and immigrant status. 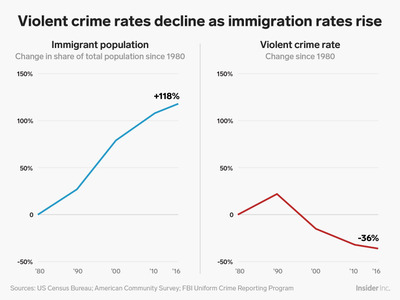 Still, multiple studies using federal and state data have found no suggestion that rising immigration rates leads to more violent crime. The charts below come from data in a December 2016 study published in the Journal of Ethnicity in Criminal Justice. They show that US saw a 118% increase in its immigrant population (documented and undocumented) from 1980 through 2016. Yet during this same period, the rate of violent crime – homicides, rapes, robberies, and assaults, according to the FBI – fell by 36% to about 386 incidents per 100,000 residents. A study published in February by the Cato Institute, a libertarian think tank, further rejects the idea that illegal immigration is tied to increases in rates of violent crime. 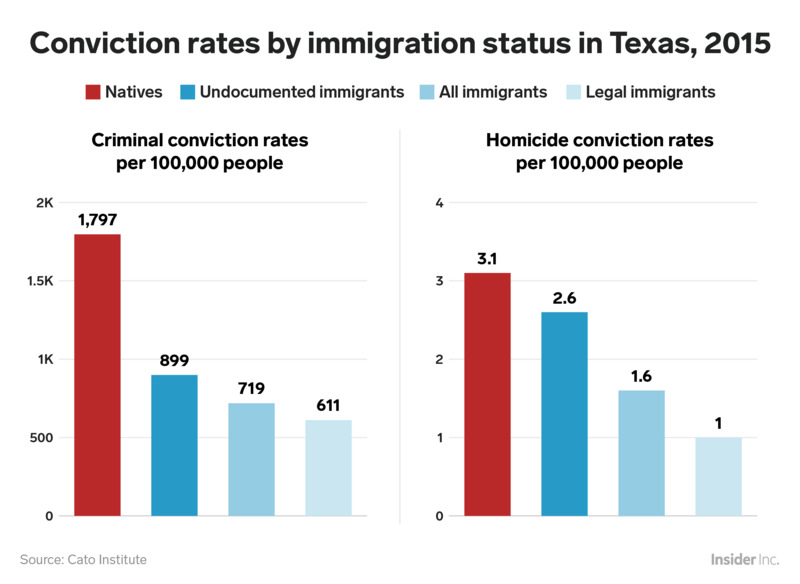 The study looked at conviction data in Texas – the state with the second-largest population of foreign-born residents – for native-born, unauthorised immigrant, and legal immigrant residents. The research found that native-born residents were most likely to commit and be convicted of crimes, while unauthorised immigrants saw a conviction rate that was about 50% lower. 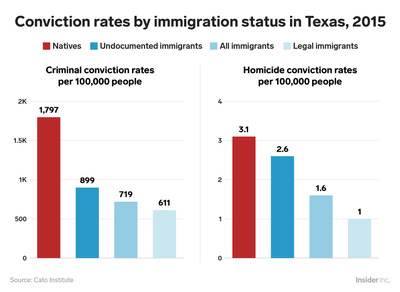 Legal immigrants appeared to be the most law-abiding, with 86% fewer convictions than native-born Texans. There’s also a Criminology journal study from March that examined states’ reported rates of violent crime and illegal immigration. From 1990 through 2014, that data found a negative correlation – meaning that the more a population was made up of unauthorised immigrants, the lower the violent crime rate seemed to be. So while tragic individual stories of murder are worthy of public attention and the victims worthy of justice, they are also single trees in a forest of data. 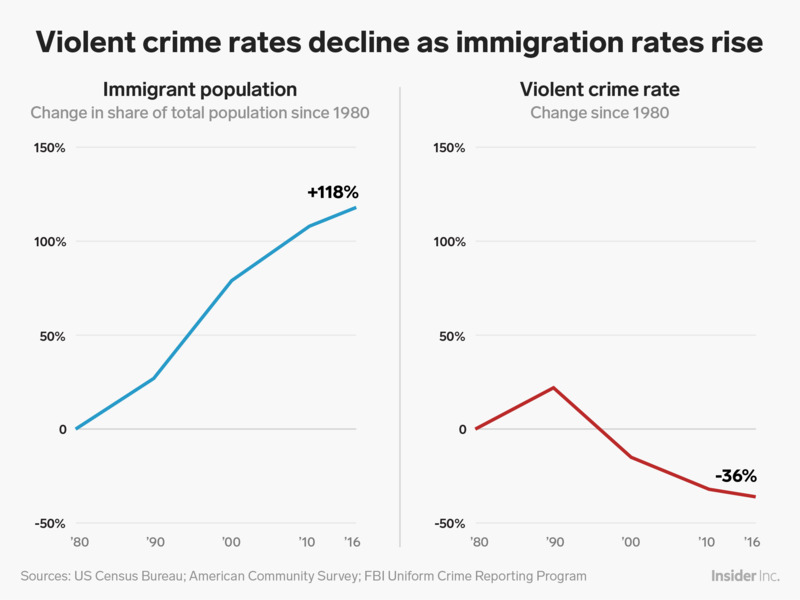 These recent studies encompassing large data sets suggest that increased immigration – both legal and illegal – is not tied to higher rates of violent crime and in fact appears correlated with its decrease. Leanna Garfield and Shayanne Gal contributed to this report.